Smile Cushion. In multiple colors. Store > Meditation Accessories > Smile Cushion. In multiple colors. 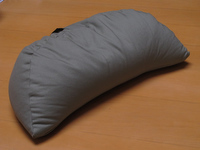 Pariyatti stocks buckwheat-filled Smile Cushions in three colors: sage, purple and navy blue. These crescent-moon-shape meditation cushions are for sale in our store in Onalaska, WA, USA, but we no longer ship them. Smile Cushions may be ordered for delivery directly from the manufacturer, where they are available in multiple colors and with two types of stuffing (buckwheat hulls and kapok). Buckwheat Filled Cushion Size: 22″w x 7″h x 9″d; Weight: 6 lbs. ☞ Click here: www.zafu.net. Enter the Coupon Code 1022 when you check out to receive 5% off your first order.